Triumph has come leaps and bounds since John Bloor acquired what was a failing motorcycle company in the 80’s. Under his management and ownership, Triumph has become one of the fastest growing motorcycle companies in the world. And it has expanded its product line accordingly and considerably. The water-cooled triple motor has been one of the drivers for such success. Reliable, smooth, and powerful, these motors have acquired a following. Several versions of this triple concept are the motorizing unit to different motorcycle styles – from the 675 Daytona, to the Speed and Street Triples to the Tiger 1050, the triple motor has been one of the reasons several people acquired these various motorcycles in the last several years. Meanwhile, the motorcycle “adventure” market has been growing as well. Of all motorcycle segments, this has been the strongest segment, surviving economic crisis and all other challenges faced by the motor industry. Bikes on this segment are mostly evoking the “go anywhere” attitude to riders. Whether the rider will ever take it to an off-pavement excursion or only to a Starbucks down the corner, it doesn’t matter, these bikes are somewhat designed for the adventure, which can be summarized by: mixed terrain tires, long suspension travel, upright sitting ergonomics, engines mapped to deliver higher torque at lower RPMs, and frames and suspensions that can carry higher load and luggage. BMW with their GS line up has been the clear leader in this segment as a result of their 1980’s investment in Dakar racing, and later their investment on Charlie Boorman’s and Ewan McGregor’s “long way” series (Long Way Around and Long Way Down), where they rode BMW R1150GSAs in the round the world trip and BMW R1200GSs on the trip from Great Britain down to South Africa. In 2008 BMW launched the 800GS series, a mid-sized bike for the adventure segment. A bike that evoked what the Honda (Africa Twin), Yamaha (Super Tenere), and BMW themselves had left empty when they withdrew their 750-800cc bikes this market in the 90’s. The F800GS became an instant success in a market that had mostly small adventure bikes (single cylinder bikes) or the large litter + bikes such as the R1200GS. 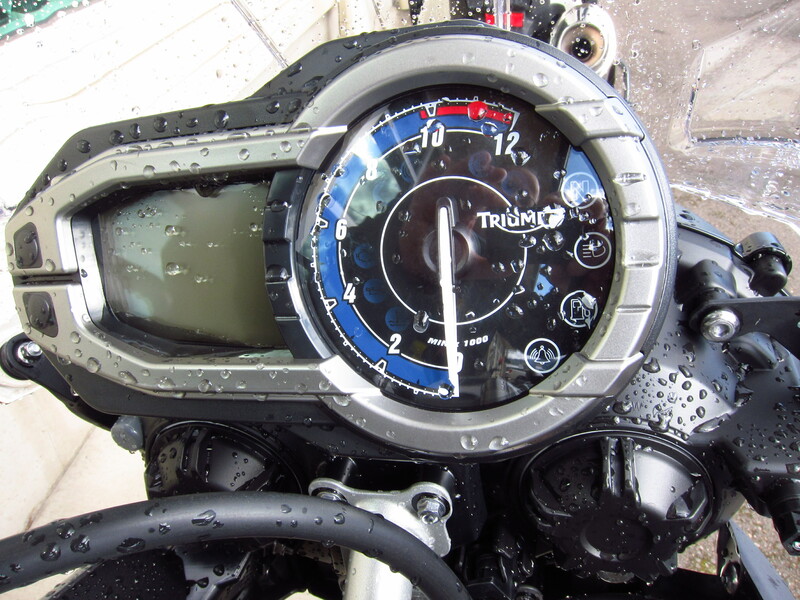 Although Triumph had designed a few products towards this segment in their Tiger series, they never quite made it into the mainstream portion of this market. Their bikes failed the “dirt aggressive” look and they also lacked the features that would allow owners to easily adapt them to the dirt. They were too street oriented. However, following on BMW’s success in the mid-size market, Triumph came up with their own bike for this segment of the market. This time they designed it to look like a desert racer, a go anywhere very naked bike. And it has been selling successfully. I would not be surprised if, by year’s end, it outsells BMW’s F800GS. It doesn’t help that the F800GS happens to be at its fourth production year without any clear design or performance changes. So, having said all of this, I was curious to see this new offering from Triumph. Before the Tiger 800’s launch in Spain, earlier this year, Triumph prepared a set of videos where you wouldn’t quite see the bike entirely. You would just hear that nice motor revving and see some out-of-focus video, a blur, or low light glimpses of the bike in action. When it finally was unveiled, it did not disappoint. Here is my report of a recent test ride of this beauty. The bike looks great. 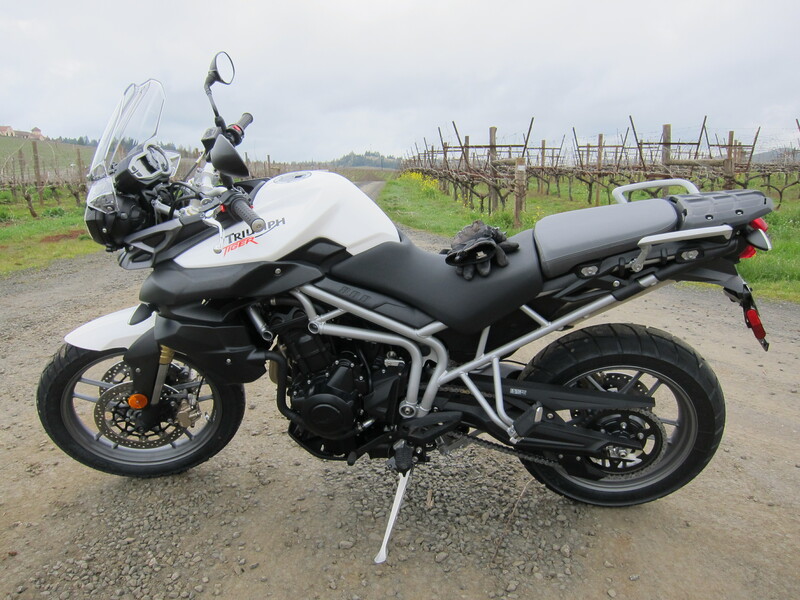 It has that go anywhere appeal to it, much similar to the BMW F800GS. The BMW has better fit and finish, it is a more refined design, and has a few extra amenities when compared to the Triumph. But overall, these bikes can be placed under the same class of adventure bikes. The BMW 800cc parallel twin motor is not as smooth as the Triumph 800 cc triple, but it has more torque, more character and a more clear “torque zone” and this torque starts earlier in the RPM range when compared to the Triumph motor. We should be clear here, both these motors are very liner in their torque delivery. Just that the BMW is a bit less linear. The Triumph motor will rev higher than the BMW, and will feel happier at RPMs to the north of 7K, at points where the BMW motor will start to run out of steam. The conclusion is that the Triumph motor, in my opinion, will better match spirited road riding while the BMW will feel better on the dirt. I explain. When I first started the motor, the immediate feeling is one of power, as I enjoyed the nice triple exhaust note. When you release the clutch, though, the delivery is smooth and progressive. This bike’s torque won’t come in until you rev it up above the 3.5K line. And it will continue on a smooth power delivery until close to 10K. But it will really feel “on the boil” or at the point where you know the bike is ready to pounce at small wrist input, at the 7K level or a bit north of it. So here is the deal. If you want ride it off road and you want to rock crawl with this bike, the first gear will probably be a bit too tall, and you will feel the problem when on steep climbs specially. If you want to ride it on the boil, you will probably need to be on 1st or 2nd, as high revs are required. If not on 1st or 2nd, you will probably be going too fast for a dirt road if you need to drop in 3rd or 4th gear… Of course, everything is doable and on dirt you may get to slide the rear with less need of power. And people have different riding styles. 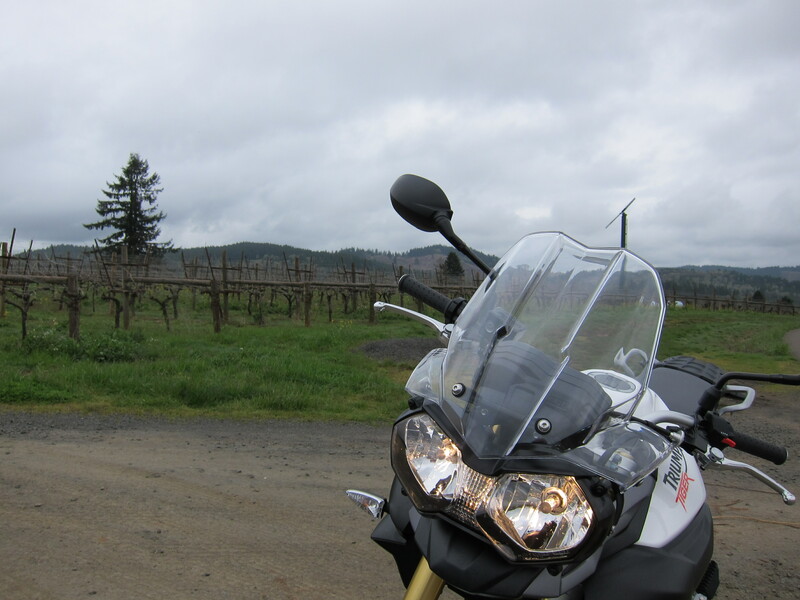 For me, I see a clear advantage for the F800GS when talking about dirt riding. 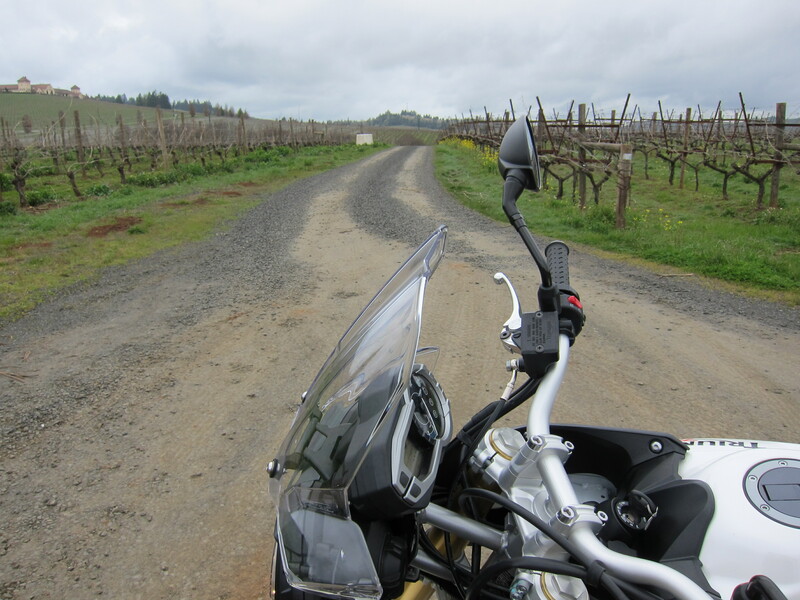 On the other hand, when the paved road is your main playground, this bike is just fine. It has the “adventure” ergos that I like. Well, the handlebar position forces your torso a bit too far forward. But this can be corrected with bar risers. And the pegs to seat distance can be considered cramped by some. But other than that, it is a perfect road bike. Acceleration is smooth, brake action is very gradual and controlled, the seat is comfortable. 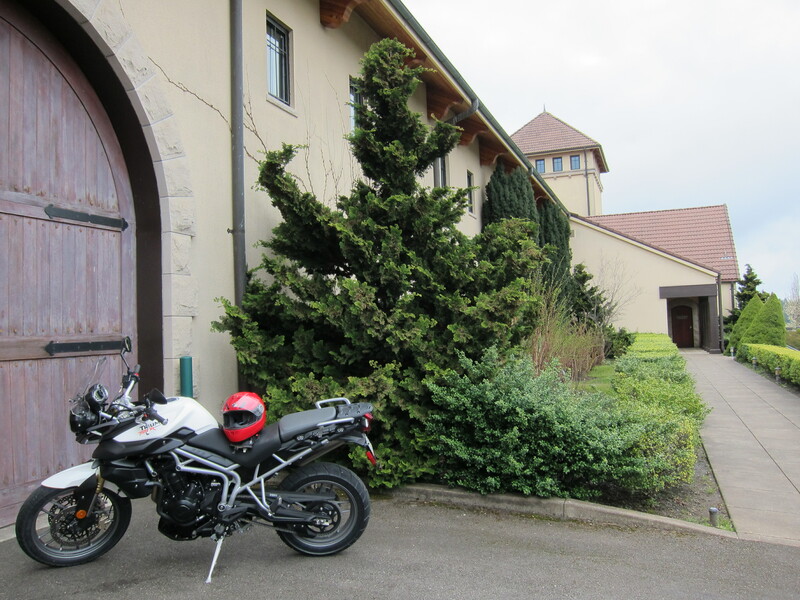 All in all, a perfect touring bike, including comfort and cargo capacity for pillion and bags. Overall, a very, very nice bike. Would I buy one? If I can keep a middle size, better dirt oriented bike in the garage, than the answer is yes. And since I still have my Dakar, and also my WRR, well… Then yes. I just placed an order on an Orange Tiger 800XC. Watch this space for when it arrives in my garage. 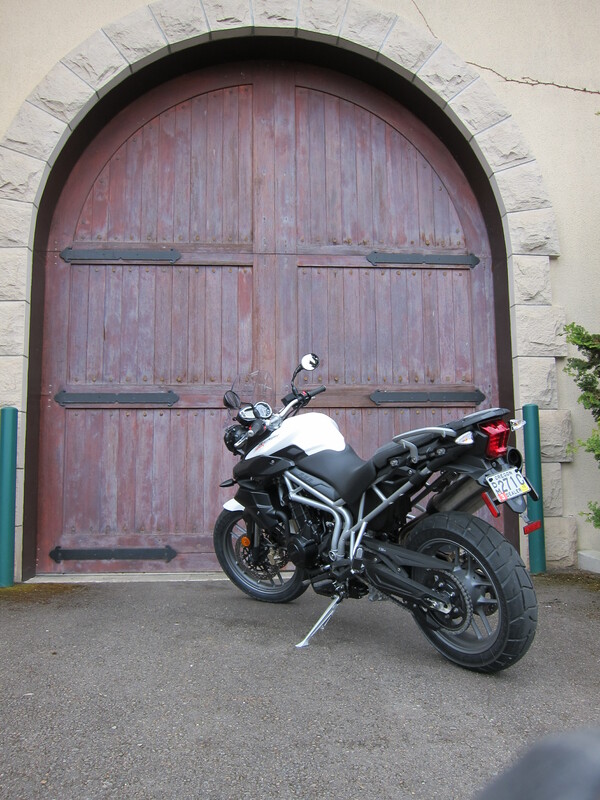 I just bought a 2011 Tiger 800 with 1800 miles and am gathering info on bags and such. I saw your Tiger video with the Giant Loops bag and Pelican topcase and it looks like it works nicely. I’m curious what fitment mount you use for the Pelican. Thinking of going with a Bag-Connection City tank bag and either the Coyote soft luggage or a Dry-Spec bag from Twisted Throttle. Any experience with the Fandango Tank bag? Congratulations on your bike. These are great bikes! About the giant loop bag, I don’t think the Coyote is the best fit. The Great Basin is the way to go, in my opinion. The bike is too wide for the Coyote. I don’t have any experience with tank bags, but if I had to have one, I would try the Fandango, just because it is not too large. If you read my report on the Giant Loop bag here, you will realize I’m not a big fan of tank bags, especially the ones that are large. Enjoy your bike and the adventures you will share with it.